Fans of highly processed dime-a-dozen sweets, perhaps this particular indulgence isn’t up your alley. 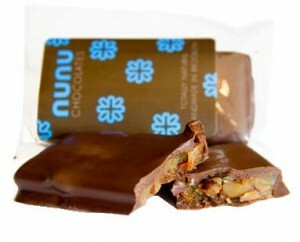 With just 8 ingredients (the majority of which most kindergarteners are familiar with), Nunu Chocolatesâ€™ Bacon Toffee Bar seems like far less of a devilish indulgence than what you might find at the checkout line of your local grocery store. Of course, Iâ€™m not about to suggest that anything incorporating bacon deserves a nutritional halo, and since the version used in this recipe is apparently not certified organic, itâ€™s likely factory farmed which brings up an additional slew of red flagsâ€¦but Candy AddictÂ® is all about edible escapism, so letâ€™s regroup, shall we? These treats make me selfish. I shared them with my roommates because I wanted their opinions for the review, but make no mistake, I resented it. 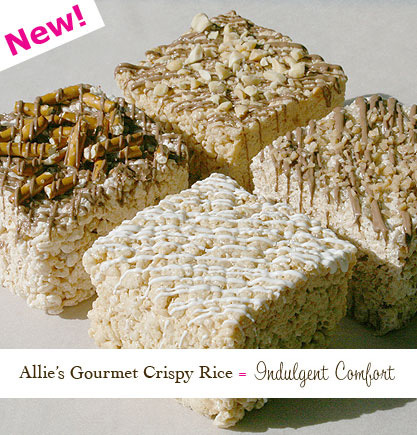 I open one of the packages of Allie’s Edibles Gourmet Crispy Rice treats and I’m overcome with the sweet smell of nostalgia wafted to my nose. It’s surprising how many of my childhood memories involve delicious foods (rubs belly and whispers “memories”). Rice crispy treats were and still are one of my favorites. We even grew up calling them “Rice Crispy Candy”. Adventurous as always, my Mom had coined a new name for them. It was only later as an adult that I realized this was not their proper name – to my embarrassment. 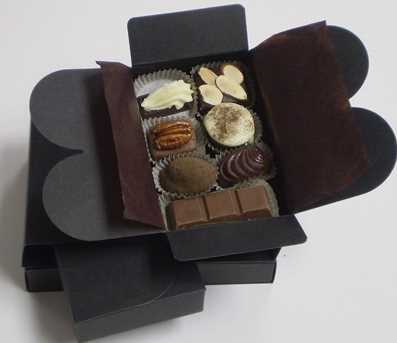 Another box of filled chocolates to sample! You guys have no idea how hard I work for you. Derry Church Artisan Chocolates have a schtick which is kind of cute, where each one is named after a city and is flavored with stuff that at least sort of has something to do with the place they are named after. They also have some flavors that I can pretty much guarantee you have never encountered, which is sometimes a good thing and sometimes very much not so good at all. San Fran – black mission figs. Good dark chocolate. Just a hint of figs really but it’s enough. It’s a good combination. London – butter toffee and crushed almonds. I picked this up and said to my assistant “I don’t like toffee, you can have this one,” and took a little bite. And then finished the whole piece. (Don’t worry, there were two, he got the other.) Nice and buttery and not the kind that sticks in your teeth. They need to make a whole big bar of this. As I’ve said before, I can’t resist an animal-shaped candy. And when I saw these Jelly Rats in Ikea, I figured that even if these weren’t good to eat, they would be a good joke for my reptile-keeper friends. After all, why should the animals be the only ones who get to eat rats? But after my recent surprising positive experience with the Trader Joe’s Gummy Tummy Penguin, I was more open-minded to the possibility that these might actually be good to eat. So I tried them myself. There seem to be four flavors, of the yellow, light-green, orange and red varieties. They are fruit flavors, in a vague way. I found the red kind of nasty and the orange dull, when orange is usually my favorite fake-fruit flavor. The other two are innocuous. The texture is pretty soft, only a little chew to it. And they’re only vague rat-shaped. Basically these are tolerable, but they’re no gummy tummy penguins. 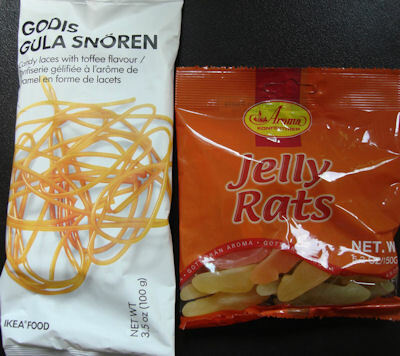 I was also intrigued by Godis Gula SnÃ¶ren because, well, they are called Godis Gula SnÃ¶ren. I guess this is real Swedish, you couldn’t make this stuff up, right? Also, toffee flavor laces seemed exotic, if not necessarily a good idea. But I was willing to give it a try. 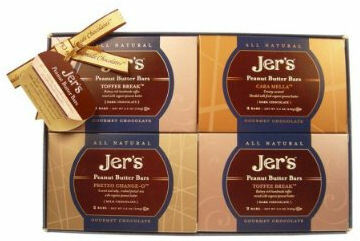 Jerâ€™s all natural Toffee Break Gourmet Dark Chocolate Peanut Butter Bars have very promising ingredients: organic peanut butter (unhomogenized, using Valencia peanuts), dark chocolate, sugar, sweet cream, salt and butter. (Notice: no trans fat or hydrogenated oils, and no artificial ingredients.) Sounds good, right? Well, you haven’t read his PR. In the Jerâ€™s Handmade Chocolates press release FAQ that accompanied my sample, founder Jerry Swain asks himself, â€œNow that you own your own chocolate business, why do you think people enjoy your story?â€ I wonâ€™t bore you with the answer – itâ€™s as banal and self-congratulatory as the rest of the document’s fatuous verbiage. But hey, even hot air balloons sometimes carry good candy, right? So let’s check these out. The Toffee Break package contains two small-to-average-sized, individually wrapped candy bars (50g, 1.75 oz each). Unless you live in San Diego, you’d have to buy these online. On Amazon, when you include shipping, they cost $35 for 4 packages (for a total of 8 bars). That works out to $8.75 per 3.5 oz package of two bars. Geez, these better be good.